Find hotel near Ka 'yok' Planetario De Ca .. Although termed as a planetarium, this place is much more than that. It has actually a Water Museum, an auditorium and observatory. Keeping in view the importance of the Mayan civilization to Cancun, this planetarium invites you to visit the archaeological sites of the region. Moreover, you can also enjoy many astronomical and scientific projections that keep on taking place here. Merging fun with knowledge, this planetarium is a must visit for people travelling to Cancun with family. Also, visit the popular attractions in the city by following Cancun itinerary 5 days. 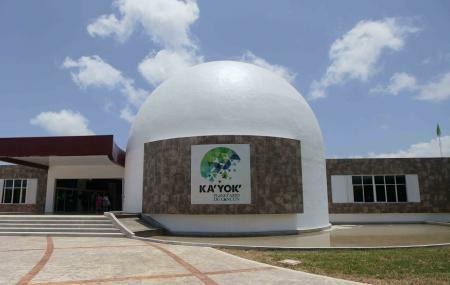 How popular is Ka 'yok' Planetario De Cancun? People normally also visit Selvatica Zip Line & Jungle Canopy Adventures, Cancun Mexico while planning their trip to Ka 'yok' Planetario De Cancun. I have gone a couple of times to the Planetarium. It is definitely the smallest planetarium I have ever seen. However, it is nice and the star show is very good. I also went to see a band play "Pink Floyd" and although the auditorium was very small, the ambiance was great. It needs upkeeping. It's not worth going out of your way to see. It's in need of a paint job and doesn't have any real exhibits like other planetariums. It's a waste of time. We went to an evening show in the planetarium. Before the movie they showed a projection of the night sky for that night and explained different constellations. Movie afterwards was good, and they ended by showing a weird short film that consisted of zipping along a Mobius strip, accompanied by wild harpsichord music. Fun though! Realizan diversas actividades para que los pequeños se adentren en el mundo de la astronomía. Las instalaciones son adecuadas para personas con diferentes capacidades. Hay incluso un club de oratoria!